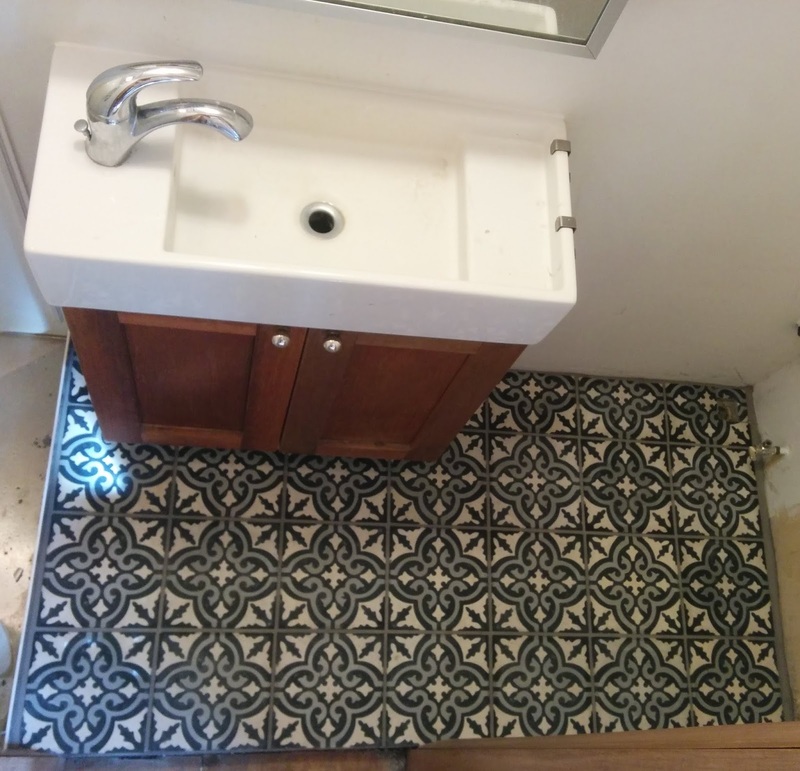 I just had the tiling done in my tiny house bathroom and in the process learned a lot about chemical-free grouts and thin set mortars. I used Custom Building Products' Thin Set Mortar which is zero-VOC (and mildewcide-free). It had a bit of a smell when wet but seemed fine once dry. You want a water-based thin set that is not mixed with latex or acrylic additives. The unmodified one is recommended for floors and may not be suitable for all applications. Schulter also makes an unmodified mortar. Avoid the toxic epoxy thin sets. Avoid toxic mastics as well. Although there are some tolerable tile glues like Eco Bond and AFM. Another non-toxic thin set to try is C-Cure 911 which does not have synthetic additives last I checked with them. These non-toxic thin sets are more prone to cracking than ones with more additives, and you have to check if you application requires polymers. 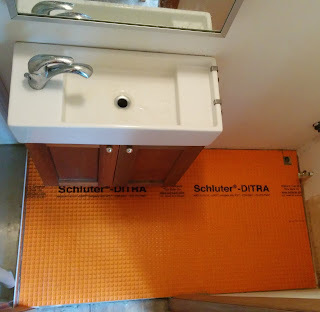 Over the first layer of thinset I used Schluter DITRA (polyethylene with a fleece backing), an uncoupling membrane that will help prevent cracking when my tiny house moves (it worked well and did not have a smell to me). 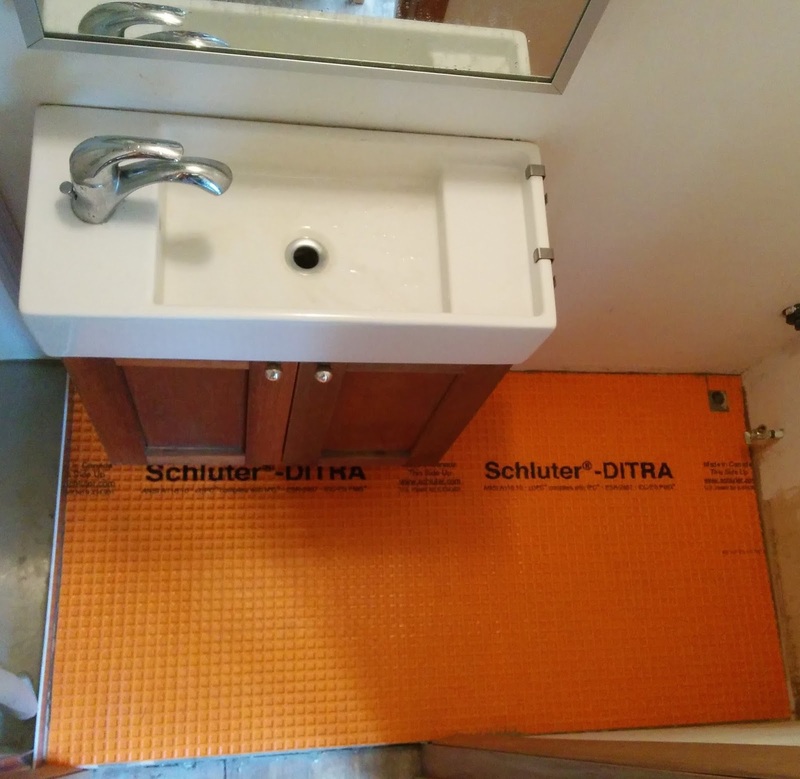 If you just need a waterproofing membrane use Schluter Kerdi (a modified polyethylene (PEVA) core with non-woven polypropylene). For a tiled shower, the Kerdi shower system is recommended. Be sure to test all parts including Kerdi Fix sealant (though you can use your own thinset, as long as it's compatible). Instead of using the membranes you could use Kerdi boards or Wedi panels. Test for tolerability before proceeding, they are not odour-free. I used this grout, the same brand as the thinset, which is also zero-VOC and contains no mildewcides or antimicrobials. It comes in sanded and unsanded and in different colours. (unsanded is for marble and certain tiles). It barely had a smell, though it does have polymers which may not be tolerable to some. If that one is not tolerable, Hydroment is recommended for people with sensitivities. However, it has a small amount of latex additives and contains mildewcide. You can make your own with Portland Cement (no additives) mixed with sand, lime and water for a totally chemical-free grout. Here are the ratios. Laticrete also makes a number of zero VOC grouts and thinsets that may work for you. It's a matter of finding out which additives work for you and if additives are required for your application. Before planning out the project (especially shower walls, make sure you know which kind of grout and mortar are required and if you can tolerate them). Those who are sensitive will probably want a concrete-based grout (like those above) and then see which if any additives can be tolerated. Since additives are trade secrets and polymer is a word that can mean a variety of chemicals (there are over 10,000 polymers that can be used in cement) you will probably have to test them. Common polymers are latex-based, Acrylate copolymers (acrylic eg. PVA), Styrene Butadiene Rubber copolymers (SBR), and Vinyl Acetate-Ethylene copolymers (VAE), and Ethylene-vinyl acetate (EVA). They might come mixed in or you might mix them in yourself. Mixing them in yourself has the advantage of being able to test the additive against your sensitivities in a more concentrated form, on the other hand, you may not want to test the grout until it has cured. Polymers are added to improve chemical resistance, reduce porosity, improve flexibility, and freeze/thaw stability (source). You will have to find out when and where you need additives, which depends on your project. Are Thinset and Grout Safe? Sanded grout contains silica (the same substance as glass) which is harmful to breathe in when in dust form. Use a N95 mask (or better) when mixing it until it is fully mixed. This is completely safe when it is no longer in dust form. There may be other minerals in there that are a problem in dust form like aluminum oxide, which can result in a high health rating on the SDS and other warnings. Some cements contain fly ash and others don't. Otherwise, plain Portland Cement does not have any other harmful additives. For something more waterproof check put QuartzLock; this won't be tolerable to many. This is a urethane based grout, not cement. I used concrete tiles from Morocco. For more on choosing non-toxic tiles see my post on bathrooms. I sealed the concrete tiles and grout with AFM Safecoat Penetrating Water Stop. Grout is porous and should be sealed regularly. If just sealing grout (and not tiles) use AFM Safecoat Grout Sealer. Custom Building Products also makes a grout sealer that some people do well with that has less than 1 gram per litre of VOCs. ECOS, a well-liked brand has a stone sealer that can be used on grout. Acri-Soy is a concrete sealer that is well tolerated that can be used on grout. Sodium silicate (aka water glass) is an idea that gets mentioned a lot in MCS circles. When I spoke with a company that makes sodium silicate they recommended against using this on tiles in the shower. Here is a brand that has been used by someone very sensitive, she said it was somewhat waterproof and she was happy with it in the shower. Technically it's a densifier and not a sealer and normally it doesn't claim to make concrete waterproof. It is used in concrete polishing systems and in radon sealers. Very informative post and site. Thank you for sharing. One of the issues I have is finding mortar and grout that are low in VOC as well as chemical exposure but at the same time without any ingredients labeled as carcinogens. Every product that I have found contains some carcinogen or toxic ingredient. Are there any alternatives that you have found on this. Silica sand seems to be the primary issue on the most used ingredient across this products. Hope someone has found an alternative product(s) that they can share. I had the same concerns reading the MSDS of the products. Happy to hear once cured .... that is safe. Find the least toxic mortar and grout possible and then use a sealer like AFM SafeCoat Grout Sealer, or even their Hard Sealer and Safe Sealer products, concieved especially for stopping off-gassing. They seem to be 0 VOC , formaldehyde etc. There surely are other eco-sealers available if you check, so it can be an effective solution for the off-gassing as well as mold prevention for grout, since mold is also a carcinogen and super-toxic in many other ways. I already have QuartzLock urethane grout. Do you think that product would be okay to use to re grout bathroom tiles? It has a VOC level 35 g/L, so up to you. That is low VOC. How have the tiles held up after moving the TH? any cracking of the grout? No, no cracking after the move! What about caulk? Is there a completely nontoxic zero voc one I can use around my bathtub where the water will be touching it every day? I couldn't find it. Can you please direct me to it somehow? Also, why doesn't polyblend advertise their grout as non-toxic? Also, I have old tiles in my apartment. They were put there 67 years ago when the building was first built. When I said this to the worker at home depot he said I have to get the non-sanded grout for the area around my bathtub, saying sanded is usually used for floors. I bought sealer from green planet paints. How does this sealer compare with the one you recommended? Thank you. I do not know of a sealer by Green Planet Paints. Send me the link that you have. A lot of products that were never toxic don't advertise as such. The same thing goes for drywall mud and until recently drywall too. I suspect certain grouts will seek green certifications soon. Thank you. Your posts are very informative and useful. I couldn't copy the link here, but if you go to www.thefirstgogreenstore.com and once there click on green coatings and toppings you'll see the description. Greenplanetpaints.com is their sister site. This blog is so informative, but the grout recommended above says on the back of the package that I contains chemicals known in state of CA to cause birth defects or something to this effect. Silica. In dust form it is harmful. Don't breath it in in dust form just like any product containing silica. Completely safe once dry. Glass is silica. Think of glass in solid form. Premixed version of same exact product says the same. Premixed version of same exact product says the same. Is it just as safe to get the Premixed one then? Also I read somewhere on this blog that polystyrene is a safe material to use. An article I read on treehugger.com written by a PhD chemist appears to state otherwise... yet the alternatives suggested are also not green. I consider that to be a safe product other than the flame retardants. Discussed in detail in the post on insulation. Not sure which article you are referring to though. In terms of environmental effects it's not considered the greenest product but I look at effect of its use in homes. Corinne.. you suggested avoiding latex and acrylic additives in thonset. I noticed when looking at the MSDS sheet for Benjamin Moore Natura paint that the base is acrylic latex, can you explain the difference. Can all be most confusing. Many people cannot tolerate the acrylic paints at all though I suggest the ones that are 0 VOC and best tolerated. The additives in grout are not disclosed so I can't do a direct comparison between the ingredients. But some very sensitive people would have trouble with acrylic. I have a floor I thought was concrete, I planned to paint it with SafeCoat concrete paint, but it turns out the floor is Gyprete. I want to tile using thinset but can't even walk on the surface because the dust coming off, it needs to be sealed. Talked with tech reps at both SafeCoat and Benjamin Moore, neither is sure they have a product that will adhere to it, and the 046 BM primer they think might work has mildewcide. Any suggestions? Does Schluter (same brand as the ditra you used) all set (their thinset) contain vocs? I would like to use it, because if you use both ditra and their brand thinset there is a lifetime warranty. However I haven't been able to find online if it contains voc's. ALL-SET is modified so it contains unspecified polymers. They don't list the VOCs but it would likely pass as 0 even though the super sensitive cannot tolerate many or all polymers. very glad i came across this page, we have a baby and are looking to redo the vinyl to tile and was wondering what your opinion was on which brands would be less toxic(no vocs and other harmful chemicals to babies)for us to use! need help picking a back board, mortar/thin set, grout and a sealer if we need it. hoping you could help! thank you. Brands are listed here. There is also a post on bathrooms with backerboards and tiles. What do you think about forbo marmoleum 885 adhesive, how safe is it compared to the ones you listed! On paper it looks fine.